Click here to check out coverage of the Maya Fashion show and soft launch of Kavita Ramdya’s “Bollywood Weddings” at Mint Leaf Restaurant in “Miss India Magazine”, “News India Times“, “Mayfair Times” and “Delhi Times”. 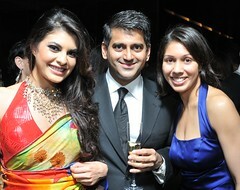 On the 22nd of November 2009, writer Kavita Ramdya soft launched her book “Bollywood Weddings” at Mint Leaf Restaurant & Bar where top Indian fashion designers Satya Paul and Deepika Gehani from the house of Genesis Colors were joined by Guest of Honour Jacqueline Fernandez, Miss Sri Lanka 2006 and star of the new Bollywood film “Aladin” with Amitabh Bachchan, in staging a fashion show. Festvities included a three-course meal and cocktails, magician, live deejay, and a fashion show entitled “Maya”, displaying Paul and Gehani’s fall/winter 2009 collections. Although the crowd was a diverse one, the theme for the evening was fashion through and through. Chapter 3 of Kavita Ramdya’s book “Bollywood Weddings” examines four disparate bridal outfits worn by Indian-American Hindu brides at their weddings including a white Caroline Herrera gown, a red dress from Macy’s, a custom-made gold outfit based on a lengha seen in a Bollywood film, and a traditional red-and-white South Indian wedding sari. Many of Paul and Gehani’s designs were created as wedding ware either for the bride herself or guests. The colorful nature of Indian bridal clothing took a whole new level of meaning with the designers’ inspiration which came from the concept of “maya”, or the illusory world, as conveyed through the use of colors on the fabric as if refracted through a prism. Thanks to Mr. Dinesh and Anjali Guptara at Mint Leaf Restaurant & Bar for hosting the event and Sohail Anjum at “Asiana Magazine” for the photography.